Orrville Red Rider Sports Blog: Hoops Preview: Why 2009-10 will be a good year. I mentioned this in a blog post back in the summer, the link points to a Ohio High School basketball blog, and more specifically, the authors insistence that Orrville basketball will be a threat on the state level this coming season. He has since written a follow-up that seems to tell me that this guy knows what he's writing about. There seems to be a lot of talk about individual recruting on his site, so I don't know how that translates to knowledge about teams, but the guy certainly knows his basketball in Ohio, so I wouldn't necessarily dismiss his opinion. It's just good discussion at this point. New coach + new attitude + slightly beefier schedule + drop to Div. 3 = A lot of potentially positive things. Add in new red uniforms and I'm excited. You heard right...red freakin' uniforms......observe. So long black uniforms. Well, not really, the JV gets to wear them now. But, back to the old school red uniforms for the varsity. Awesome, awesome, awesome. I know it's just a jersey, but I could never get excited about the black jerseys. 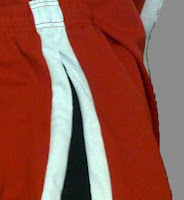 I like how these kept some black in the outline and in the shorts stripe....but it's predominantly red and white. Black should be an accent of our uniform design.....can we just make it a rule? If the team plans to wear them for road games only, which I think is the rule (white at home, dark on the road)....then fans won't get to see these in action until the 18th of December when the team travels to West Holmes. About the uptick in strength of schedule. The opener is against Shelby, instead of a Cleveland City School....and we drop Timken for Wadsworth (fair trade). Obviously, 14 games are taken up by the OCC part of the schedule, and we still play Triway, Akron East and Northwestern. The biggest improvement in scheduling is at the Smitty Classic, no cupcake this year...rather the Smithies of Smithville. Should be a great atmosphere and a possible district final preview. Here's the schedule in it's entirety. The OCC will be another grinder with good teams from top to bottom. Jake Bolyard and Zach Wasson should lead the team early on. Jake should improve on his 19 ppg scoring average and may see more time at point guard early on as the team seeks to establish a true option at PG (probably Joey Besancon early on, but I'd love to see Jordan Ray step up and be our PG for the next few years). Zach crossed the 500 point plateau last season and will seek to improve on his almost 15 ppg. average from last season. I'm undecided on the Wasson Watch, maybe I'll do it, maybe I won't. I'd love to know how close Jake B. is to scoring 1,000 points. He had 400+ last season and if he repeats that, it will obviously put him close. Maybe I'll do some digging in the archives and find that out. If anyone knows, please let me know. We might have to do a "Bolyard Board" this season. I'm pretty sure my guess of 550-575 career points is close. So let's just say if he averages 20 ppg. this season, he'll be in the club. As always, the team's success will depend on not just the standout players, but the role players and backups. One thing I did like about the former coach was his insistence that we always strive to have deep teams (I just think the way of developing that depth by wild substituting wasn't the best approach) and that will be the case again this season. Finding the right mix and utilizing kids to maximize their potential will again be key. One unknown will be the play of 6'7" Devon Winters. Anyone with size like that can only be an asset on the court, you simply can't teach size. I'm guessing he comes from the same Winters family that are very familiar to Orrville basketball fans. Here's the varsity roster as it was told to me...broken down by class. Of course, some of these kids may split time on JV, and some names not on the list may make their way up to varsity as the season progresses. It is encouraging to see 14 names on a varsity roster. What a good problem to have. I'll be along for the ride just like the rest of you. It's tough to NOT get excited with the kids we have back and the numbers that are going out for the team. Sounds like Coach Sly is doing his best to bring back some much needed respect and pride to the basketball program. Nice preview, Tim. BTW, the Winters kid's father is Ralph!